Decker Marketing » Is Your Marketing Head in the Sand? 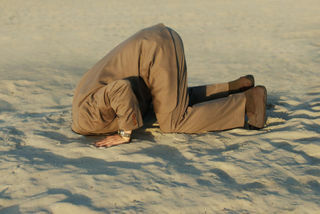 Is Your Marketing Head in the Sand? It seems most marketers, at times like this, are retrenching and burying themselves ‘in what they know’. Or they're being asked to. Managers are afraid to tee up new social marketing ideas to senior execs, since "6 programs just got cut". The CFO is asking to cut any marketing that can not be proven to be accretive to current ROI figures. Assume everyone else is doing that (burying heads in the sand). Don’t you (as a person and business) want to stand out and differentiate? Don’t you want to go where your competitor is not? Don’t you want to be stronger and smarter than competition with social marketing activities as we come out of this recession? Aren’t customers even MORE wary of traditional marketing and advertising, turning to each other more for authentic advice. User generated content is growing at times like this – in both creation and consumption. 8 out of 10 shoppers consulted reviews before buying their holiday gifts. 70% of Twitter accounts were created in 2008. Facebook is expected to grow to 200M (from 150M users) by the end of this year. And I’ve seen no slow down in customers posting user generated content through our clients. Don’t fall back when the rest of the market is moving forward. Take this opportunity to take advantage of sleeping competitors. Be the light for customers who are looking for authentic, transparent brands. And do your career a favor and take a (perceived) risk, making the case for your business and your customer to market with the wind of their voice at your back. This is a great post. Often when times are tough the most creative and those willing to take risks jump to the front of the pack. The unsure huddle together and rationalize – while the leaders lead. But too many people hide in that sand pile. Business as usual just brings business as usual. I think this post has the legs for deeper discussions. There is rise in using social media for marketing. But brands cannot discount other avenues of marketing either. Product sampling, in-flight marketing, and active outdoor networks are incredible options for marketers to pursue. It’s about being creative with matching the brand with the correct marketing outlet. Being flexible enough to try new venues but just social media. When the marketing herd as a whole takes fewer risks, the signal-to-noise ratio becomes more favorable for the marketer willing to take a step forward. Risks taken during such times are often more memorable and impactful. (And more fun; courage is WAY more fun than fear). My mnemonic for that: the Empire State Building was built during the Great Depression. A harsher phrase than “in the sand” came to mind as a location for the risk-averse marketer’s head, but it might be tough to find the image for that one. It’s my understanding that those companies that moved forward with advertising / marketing during the Great Depression were the ones that survived and even thrived. Some may think the going is tough, but tough or not, it’s time to get going. Whatever the economy is doing, you want as much market share as you can get. When the competition stops thinking, you need to act. Hi, Really great Sam. All marketing executives must think of how they can push up their business during recession periods. I think this post will help many people in marketing field to improve their sales. © 2009 Decker Marketing. All rights reserved.